The Dane County Farmers’ Market on the Square is a Saturday and Wednesday tradition in Madison, Wisconsin. You’ll find the season’s best bounty of vegetables, flowers, meats, cheeses, and specialty products from approximately 275 vendors throughout the year. Over 150 members attend every Saturday. All of the items for sale are grown, raised, and produced in Wisconsin by the person behind the stand. 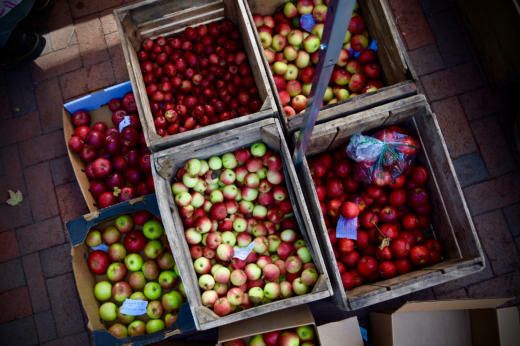 The DCFM is reported to be the largest producer-only farmers’ market in the country. All items are produced by the members behind the tables. No re-sale allowed! This means that when you visit the Dane County Farmers' Market, you can truly get to know the people who grow and raise your food. The members behind the tables are the most knowledgeable resource there is -- please don't hesitate to ask questions! Our customers are the vendors' favorite thing about coming to Market each week, so grab your grocery bags and come join us! Whether it be meats, flowers, cheese, bakery, or plants; the Dane County Farmers’ Market offers the highest quality our region offers. DCFM producers regularly receive national and international recognition for the quality of their products. Dane County Farmers’ Market. 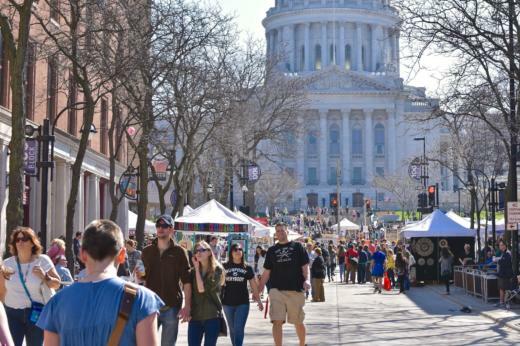 The Dane County Farmers’ Market is the heart of the activities on the Square. Our members line the sidewalk of state capitol grounds. They sell agriculture-related, producer-only products from Wisconsin. The DCFM has strict rules for selling and has a waiting list of about three years for new members. Non-profit, Political, and Public Information. The interior of the State Capitol grounds is used for non-profit, political, and public information booths and for various organizations. All permits are handled through the Capitol Police. Contact Sue Barica at 608-266-7840 or email sue.barica@doa.state.wi.us for more information. Street Musicians Add to the Fun. Many street musicians play across the four streets around the Square, adding to the festivities. Busking is permitted on the exterior of the Square, but please, keep it acoustic! We encourage all of our visitors to partake in the Market festivities as often as possible. We promise plenty of food, fun, and friendly vendors. Early arrivals get first choice of our fine selection. Remember to leave your four-legged friends at home -- pets are not allowed at the Market.